As many as 1,400 icy entities occupy a section of our solar system about 2.9 to 4.7 billion miles from the sun. The European Space Agency's (ESA’s) Herschel Space Observatory has studied 132 of these icy objects, revealing a remarkable variety of forms, sizes and colors. These trans-Neptunian objects (TNOs), which also comprise worlds such as Pluto, Eris, Haumea and Makemake, are very cold, at around -382 Fahrenheit. But these low temperatures provide themselves to observations by Herschel Space Observatory, which gathers long-wavelength infrared radiation from several of the coldest and furthermost distant objects in the cosmos. Herschel Space Observatory was able to calculate the sizes and albedos, the portion of visible light returned from the surface, of 132 TNOs (exemplified in the image above). They range from just under 31 miles to nearly 1,491 miles in diameter. Pluto and Eris are the biggest. 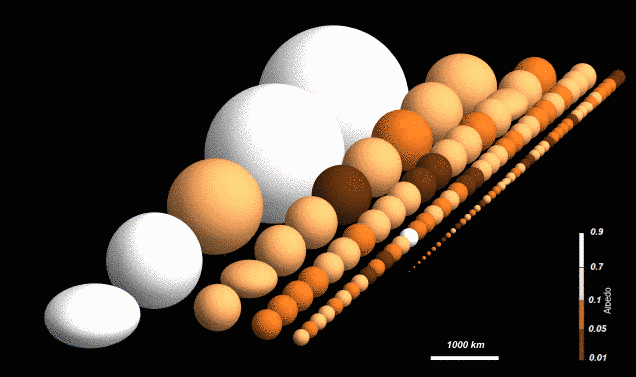 These two worlds have particularly extended shapes: Haumea (comprehended in white) and Varuna (in light brown). Few even host their individual moons. The albedo measurement suggests a range of surface configurations: low albedo (brown) is a sign of dark surface ingredients, such as organic substantial, while higher albedo (white) proposes pure ices. Trans-Neptunian objects (TNOs) are supposed to be among the maximum primitive leftovers of the planet-forming period, so astrophysicists propose to use this data in testing different models of how the solar system developed.